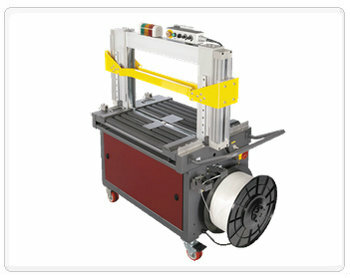 This high quality automatic strapping machine contains bottom heat sealed elements for maximum seal efficiency. Heavy duty top press device strengthens strapping performance. Including several valuable features such as auto load in feed and retracting system, loop ejector and short feeding detection device. Extra options add up its strapping performance and its user-friendly characteristics. Stainless housing is perfectly for meat or marine food products. Light or heavy duty top press compactor could be also applied upon your demand. Pendant can be easily relocated.